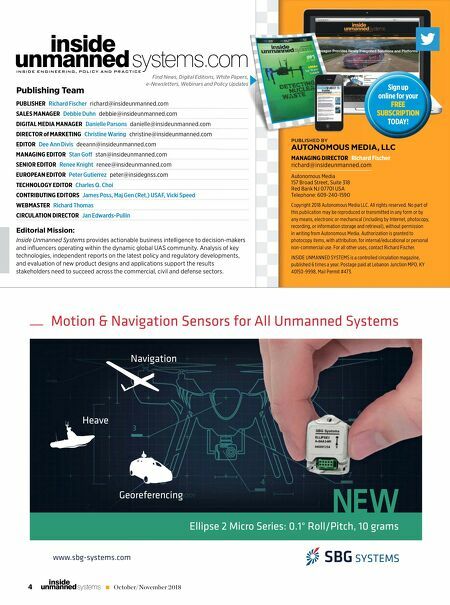 4 October/November 2018 unmanned systems inside Editorial Mission: Inside Unmanned Systems provides actionable business intelligence to decision-makers and infl uencers operating within the dynamic global UAS community. 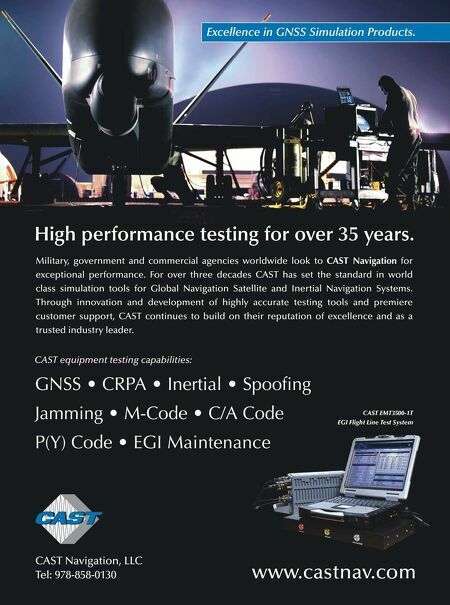 Analysis of key technologies, independent reports on the latest policy and regulatory developments, and evaluation of new product designs and applications support the results stakeholders need to succeed across the commercial, civil and defense sectors. Publishing Team PUBLISHER Richard Fischer richard@insideunmanned.com SALES MANAGER Debbie Duhn debbie@insideunmanned.com DIGITAL MEDIA MANAGER Danielle Parsons danielle@insideunmanned.com DIRECTOR of MARKETING Christine Waring christine@insideunmanned.com EDITOR Dee Ann Divis deeann@insideunmanned.com MANAGING EDITOR Stan Go stan@insideunmanned.com SENIOR EDITOR Renee Knight renee@insideunmanned.com EUROPEAN EDITOR Peter Gutierrez peter@insidegnss.com TECHNOLOGY EDITOR Charles Q. Choi CONTRIBUTING EDITORS James Poss, Maj Gen (Ret.) USAF, Vicki Speed WEBMASTER Richard Thomas CIRCULATION DIRECTOR Jan Edwards-Pullin unmanned systems.com INSIDE ENGINEERING, POLICY AND PRACTICE inside stems.com PUBLISHED BY AUTONOMOUS MEDIA, LLC MANAGING DIRECTOR Richard Fischer richard@insideunmanned.com Autonomous Media 157 Broad Street, Suite 318 Red Bank NJ 07701 USA Telephone: 609-240-1590 Copyright 2018 Autonomous Media LLC. All rights reserved. No part of this publication may be reproduced or transmitted in any form or by any means, electronic or mechanical (including by Internet, photocopy, recording, or information storage and retrieval), without permission in writing from Autonomous Media. Authorization is granted to photocopy items, with attribution, for internal/educational or personal non-commercial use. For all other uses, contact Richard Fischer. INSIDE UNMANNED SYSTEMS is a controlled circulation magazine, published 6 times a year. Postage paid at Lebanon Junction MPO, KY 40150-9998, Mail Permit #473. Find News, Digital Editions, White Papers, e-Newsletters, Webinars and Policy Updates PUBLISHED BY Sign up online for your FREE SUBSCRIPTION TODAY!